With the start of the new season on 1 September, the links from the website have been updated. The current season link will point to the 2012-13 calendar, last season will point to the 2011-12 calendar, and next season will point to the 2013-14 season. The 2010-11 calendar (previously last season) has been archived. Twenty teams took part in the August edition of the Park Avenue Doubles. 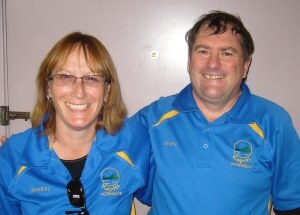 Sheryl Earnshaw and Kevin McFadgen (Kapiti) won on tie-break from Bob McCarthy and Margaret Mordecai (Otaki). The minutes for the 2012 Annual General Meeting are now available. The Wellington and Auckland development teams clashed for the sixth time over the weekend. Playing at the Herne Bay Pétanque club, the Wellington team struggled with the tricky terrain. On Saturday, Auckland gained a slight advantage (13-11) in the Singles. The Doubles were a different story as Auckland lost just three of the eighteen games to finish the day comfortably ahead 43 match points to 17. Four rounds of Triples (16 games) took place on Sunday, with Auckland needing just four wins to retain the Chanticleer Cup they won at Kapiti last year. This they managed to do in the second round. With the match secured, the draw for the final two rounds of Triples was changed so that the Open teams played against the Senior teams. The change didn't help Wellington's cause, as they eventually lost the match, 29 points to 79. Kapiti's run of successful away defences was finally broken at Masterton. A slow start saw Kapiti 2-4 down after the second round needing to win all three final round games. They won both the Singles and Doubles but were unsuccessful in the Triples. Masterton took the match by 5 games to 4. Masterton's first match is away to Otaki. Fourteen teams have entered the Women's Doubles at Kapiti on Saturday 1 September. Six teams have entered the Women's Triples at Kapiti on Sunday 2 September.